It has been said that art mirrors life. It has also been said that honest self-reflection is good for both the psyche and the soul. I would argue against neither of those sentiments. I paint people. I am fascinated with people’s faces yet far too often I have felt the need to rely on photography as a tool but I would prefer painting from life. What to do when there are no models on hand clamoring to climb up onto the model’s stand? Self-reflection. Fact is I work cheap, plus I am available. 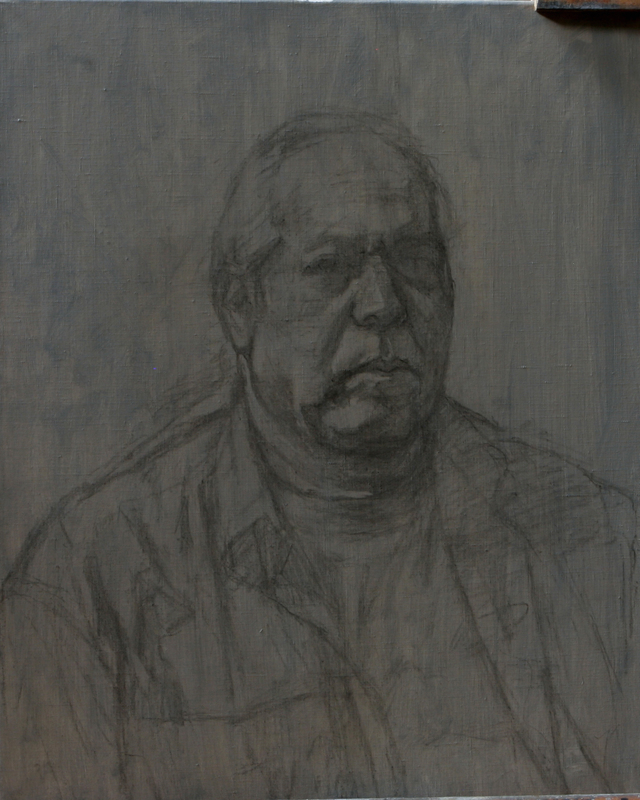 I don’t know about anyone else but I find doing a self portrait is a greater challenge than drawing or painting someone else, if for no other reason than the technical challenge of having to move back and forth between the mirror and the canvas. So very many things can run afoul of reality. Then there’s the plain fact that none of us knows how other humans ‘see’ us and all that most of us ever see of ourselves is the apparition in the mirror. “Is that how you see yourself” is a common enough reaction from others simply either because they will never really see others as others see themselves…or the self-portrait is a mess. So doing a self portrait is a valuable exercise. Psychologically and philosophically one may move through some interesting excursions on the road to painterly self actualization. I have done a number of self-portraits in my time, some good, others laughable. I once did a challenge on one of the art forums to do a drawing a day. I chose to do a portrait a day. It was a January so I ended up doing 30 odd self-portraits in as many days culminating in two successive alla prima self-portraits. 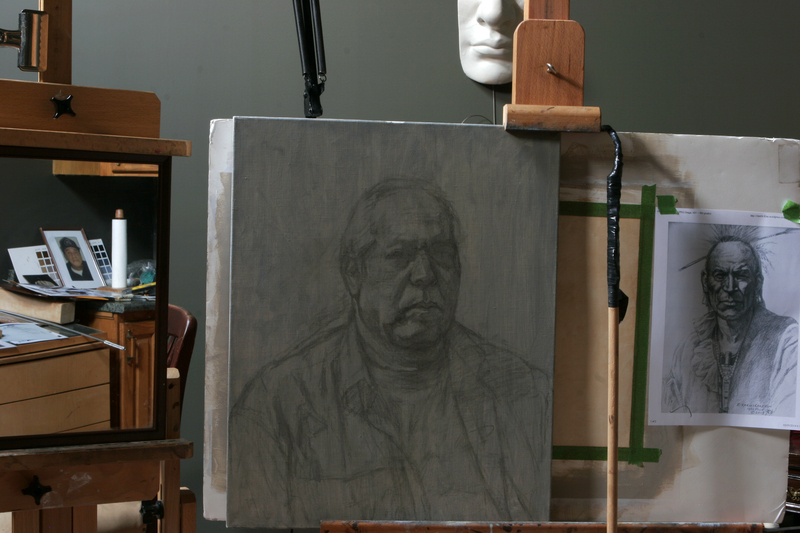 A couple of days ago my friend Eric Manella, a wonderful Montreal based realist painter, posted the start of a self-portrait in oil. That and the fact that he in-boxed me an invitation to get together for a painters play date inspired me to begin a self-portrait of my own. I have a lovely little studio with a less than dead on north light skylight….let’s call it ‘north-ish’ light. I was feeling kind of tentative and so began by noodling around with doing my block-in in charcoal, not something I usually do. More often I would begin by doing the block in with brush and paint. The canvas is an oil-primed Russian linen I purchased online a while back which I had toned a neutral gray. Size is 16″x20″. I am mainly interested in getting the big shapes correct at this point…light shapes vs. shadow shapes and working from general to specific I am probably not going to spend an inordinate amount of time on the drapery of the shirt because, while I will wear the same shirts throughout the painting process…the folds will likely move about. Since I don’t want to chase folds around every time I return to the canvas, I will wait to lock the drapery in at a time later than my ‘mug.’ A note about working in charcoal: it is easily mover around so therefore more easily corrected. I use my fingers, a kneaded eraser or a brush, even the flick of a chamois will work.